V-Ray for SketchUp is one of the most widely used and easy to learn 3D modeling software on the market today. 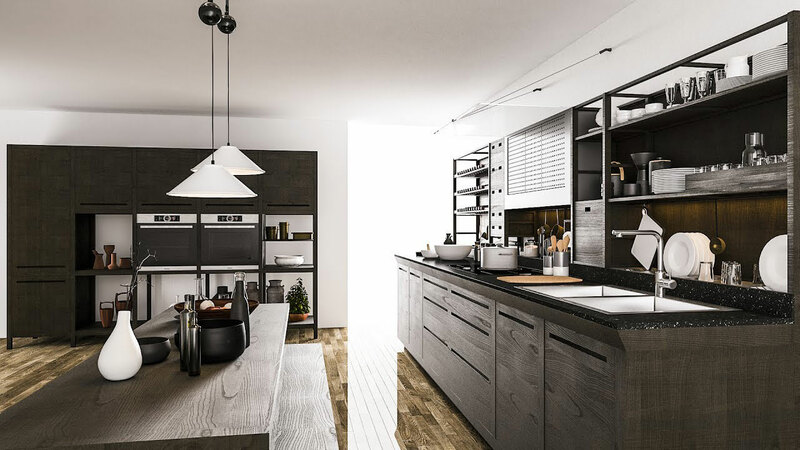 With V-Ray 3.6 for SketchUp Workstation users now have one of the most powerful rendering tools available to visualize their models with the utmost quality and realism. Interactive Rendering - Render interactively while you design. Fine-tune lights and materials and see the results right away. Global Illumination - Render photorealistic rooms and interiors with V-Ray's powerful and fast global illumination. Accurate Lights - Render natural and artificial lighting using a wide range of built-in light types. Environment Lighting - Light your scenes using a single high-dynamic-range image (HDRI) of its environment. Physical Sun & Sky - Simulate realistic daylight for any time and any location. Real-World Cameras - Work like a photographer, with controls for exposure, white balance, depth of field and more. Physical Materials - Create great looking materials that look exactly like the real thing. Advanced Textures - Create realistic and unique materials using any texture map or one of V-Ray's many built-in procedural textures. Proxy Objects - Bring more detail to your project with memory-efficient proxy models of complex objects like grass, trees, cars and more. Render Elements - Render your scene as separate passes for more artistic control in your image-editing software. Frame Buffer - Track render history and fine-tune color, exposure, and more directly in V-Ray's frame buffer. Render Nodes - Give V-Ray Swarm and network rendering a major speed boost by adding cost-effective render node licenses. V-Ray Scene Export - Share complete, render-ready V-Ray 3 for SketchUp files with any V-Ray 3.4 or higher application. V-Ray for 3ds Max Workstation is the core development of Chaos Group, which allows users to quickly and easily create realistic images while giving them full control over the 3D production process. V-Ray 3.6 for 3ds Max is the most complete lighting, shading and rendering toolkit on the market, making speed and simplicity accessible to all artists. The latest version delivers powerful feature set, technical advances and support for open source technologies. Quality - V-Ray 3.6 for 3ds Max comes with all the lighting, shading, and rendering tools you need to create professional, photo-real imagery and animation. Ray tracing and Global Illumination: SU Podium uses a photon mapping algorithm that provides accurate ray tracing and global illumination that yields beautiful, photo-realistic images. Although the user does not have to be aware of what technology is being used, it's important to note that you can obtain high quality images with realistic reflection and lighting, quickly. Cross-platform accessibility: SU Podium V2.5 Plus also supports 64 bit as well 32 bit, Windows or Mac operating systems. 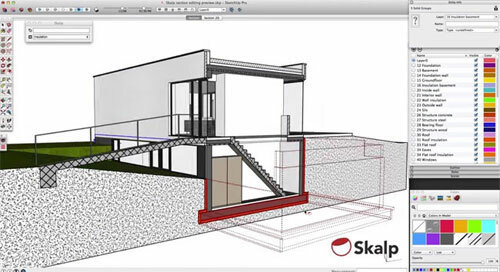 Skalp is an impulsive and robust Live Section Tool that can be used to generate stunning plans and elevations within SketchUp. Skalp will enhance the capacity of the users for making excellent drawings. Use Styles to remap the look in each scene. Neat user interface filled with relevant features. Build your own patterns from scratch. Support for SketchUp Pro’s LayOut: Persistent updates of Skalp sections in all scenes. 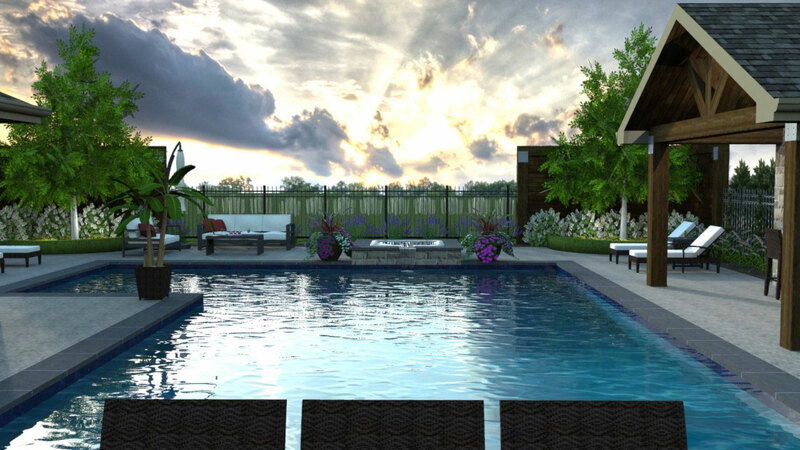 Artlantis is the fastest stand-alone 3D rendering application developed especially for architects and designers, ideal for quickly and easily creating high resolution 3D renderings, iVisit 3D Panoramas, QuickTime VR Objects and animations. A recognized leader in preview window technology, Artlantis is the rendering software used by architects, designers and urban design professionals in more than 80 countries. 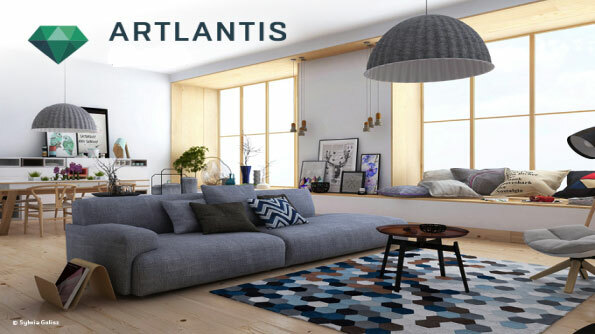 The Artlantis family offers two distinct versions, Render and Studio. Both versions are virtually identical to one another except for the animation functions that are provided only in the Studio version. Artlantis Studio: Artlantis Studio, on the other hand, is the ideal tool for anyone who wants very high resolution rendering not only for images, but for iVisit 3D Panoramas, QuickTime VR Objects and animations as well. IRender nXt is a powerful plugin for producing high-resolution architectural renderings from SketchUp models. IRender nXt is fully-integrated with materials, lighting, and components with an easy to use interface for interior, exterior, daytime, or night-time scenes. 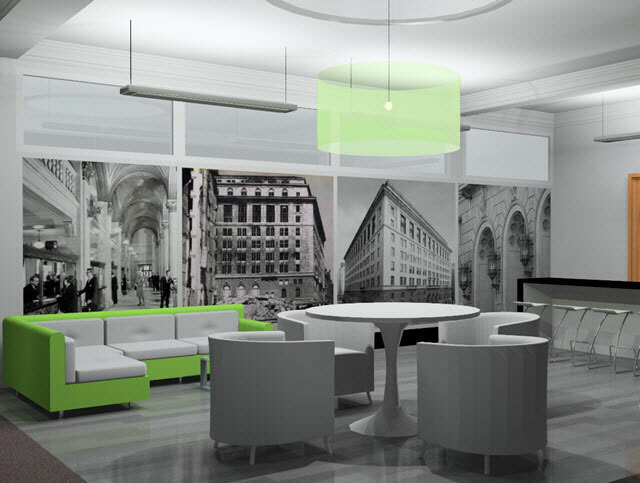 Use IRender nXt to generate photo-realistic still images, 360 degree panoramas and animations. 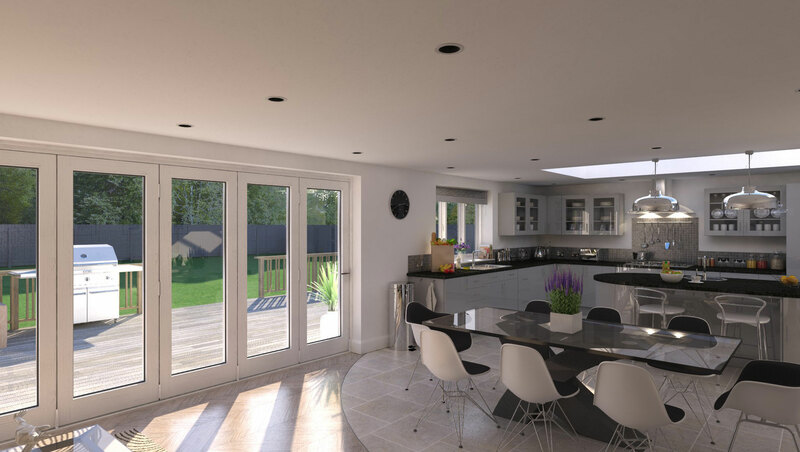 IRender nXt is the perfect tool for architects, interior designers, landscape designers, set designers, or anyone who needs presentation quality images to share their designs. IRender nXt optimizes your workflow by saving your rendering preferences inside the SketchUp model and includes post-processing methods and filters. IES Lights - Choose from 30 IES Preset Light Profiles or browse the Internet for manufacturers' IES files. Auto Reflection - makes materials reflective by using a matching word pattern method in the material name. Fine-tuned lighting, transparency, reflection, highlights and HDRi backgrounds. Save renderings in popular image formats. Post-processing features included. Adjust brightness, saturation, contrast, and more. SpaceDesign is an add-on for SketchUp for defining attributes and creating reports from SketchUp components. SpaceDesign can be very easy to use for simple reporting - such as a count and cost of components placed in a model. The report can be saved as a .PDF file, or a .CSV file. It also has very powerful features - such as length, area and volume calculations which can create more complex reports, but will also be a little harder to use. ArielVision is the perfect combination of high-quality rendering while still being extremely easy to use. ArielVision is a low cost, easy to use rendering package which makes very good results. It is easy to use because it contains only the features you need for good renderings. Uses SketchUp Material and textures automatically. Top Quality Photo Realistic Rendering Engine. Indirect Lighting for subtle, realistic shadows. Auto Bump Mapping for SketchUp Textures. High Quality Reflections – mirror-like, or blurry. Refraction for thick glass and transparent objects. Light Wizard to create many standard lights and lamps. Ceiling Lights, Spot lights, etc. Uses SketchUp Sun, Sky, and background colors. Self glow – for special items such as monitors or lighted signs. Renders in 64-bit mode on 64-bit processors. BuildEdge Pro architectural design plugin is the fastest and easiest way to create building designs using SketchUp. 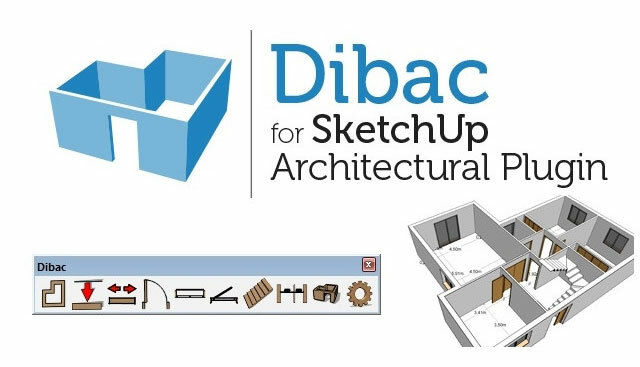 It allows users to draw and edit floors, walls, roofs, doors, and windows in 3D quickly and easily, eliminating countless steps required to accomplish the same tasks using SketchUp alone. Simple Floor & Wall Inputs - If you can draw a line in SketchUp, you can input floors and walls with BuildEdge. BuildEdge includes an industry-leading roof-generation engine that creates complicated roof solutions based on simple user input. Enhanced User Interface - BuildEdge places its tools and functions right where you need them, making the modeling process easy and efficient. Simple interface - Shaderlight’s close integration to Google SketchUp will make you feel right at home. You render directly from your SketchUp toolbar and there’s no need to import your model first. Interactive rendering - Shaderlight gives you a choice of rendering modes to optimize your workflow. Replace Me - Shaderlight’s fantastic new Replace Me feature lets you render detailed models without filling your SketchUp scene with geometry. Night Lighting - It’s easy to create landscape lighting scenes from your models with Shaderlight. Simply add Shaderlight’s light components to your model, or use DS|Sketch3D’s landscape fixture models with the light component built in. It’s now even easier to create real world lighting using Shaderlight-ready light fixtures with embedded IES files to give you the exact light and shadow detail the manufacturer intended. Real world effects - Add accurate materials and textures to your 3D model with simple presets direct from SketchUp and adjustable settings to get the perfect finish. 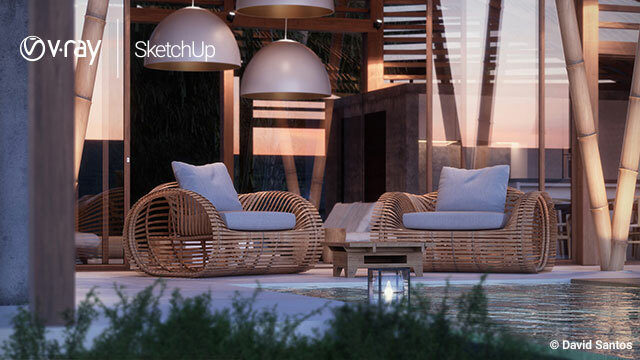 Accurate Illumination - Illuminate your scene using the SketchUp’s sun, image-based lighting or the Shaderlight physical sky. Professional lighting images and backgrounds are included in Shaderlight Pro. Presentation tools - Render plans, elevations and isometric viewpoints, or choose Chalk Render mode to produce form studies for a quick, clear presentation of your design intent. 3skeng is 3D engineering software for SketchUp. 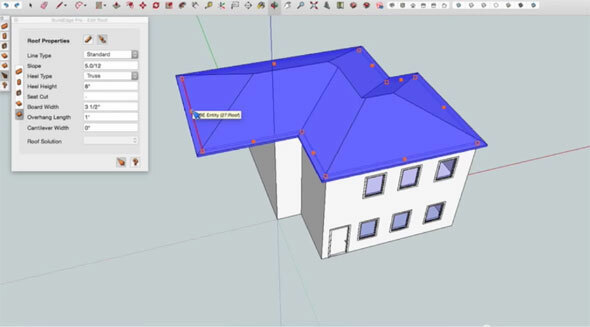 This extension is as intuitive as SketchUp and phenomenal easy to learn. 3skeng has a large professional functional range. 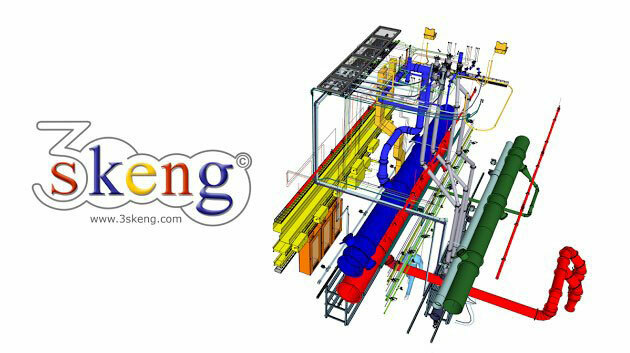 3skeng is an extension for the design and documentation of MEP and 3D piping and steel structures.